Iran Front Page- IFP has taken a look at the front pages of Iranian newspapers on Sunday, September 10, and picked headlines from 15 of them. IFP has simply translated the headlines and does not vouch for their accuracy. Iranian newspapers have widely covered remarks by Iranian President Hassan Rouhani lambasting the genocide of Rohingya Muslims in Myanmar and the international community’s passive stance and silence towards the humanitarian crisis in the Southeast Asian state. Rouhani made the remarks in his meeting with his Turkish counterpart Recep Tayyip Erdogan in Kazakhstan’s capital Astana on Saturday ahead of a summit of the Organization of Islamic Cooperation. Also in the spotlight were reactions to analyses of US President Donald Trump’s claims of withdrawing from the Joint Comprehensive plan of Action (JCPOA), signed between Iran and P5+1, and his call for reviewing the deal. 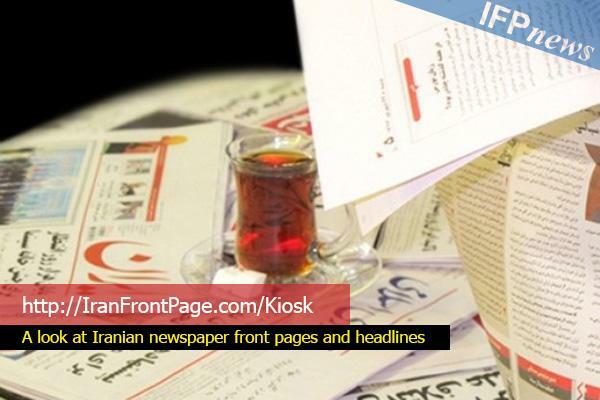 Reactions to the response by the Leader of Iran’s Islamic Revolution Ayatollah Seyyed Ali Khamenei to a letter by top Iranian Sunni cleric Sheikh Abdulhamid were among other hot topics in the limelight of the Iranian newspapers. In his response to Sheikh Abdulhamid, the Leader urged all Iranian authorities to refrain from any discrimination against ethnicities and religions in the country.